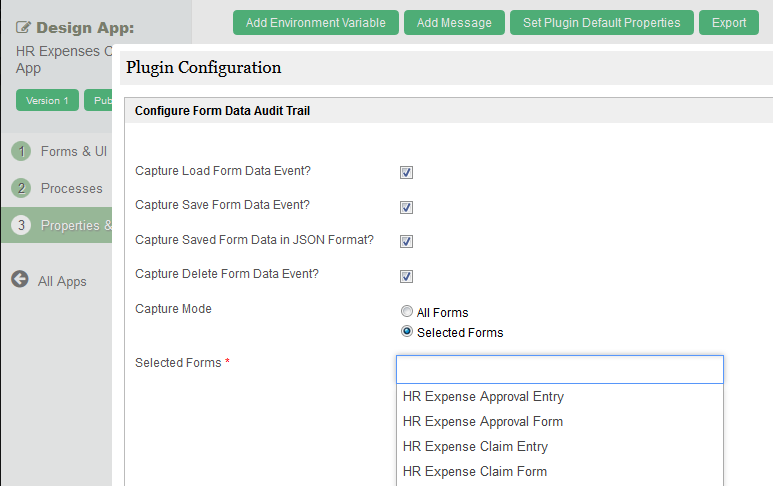 One of the most requested feature, the Form Data Audit Trail, is now available on v5. This new plugin allows the app designer to easily add event tracking capability to track all form events in their web apps. Simply configure the plugin in "Set Plugin Default Properties" under the app's "Properties & Export" section. You can configure the plugin to track events for all forms or only for selected forms, and it will capture and log the events accordingly. The following is a screenshot of the form event data that has been captured by the plugin.